Andrea Arnold’s 2009 effort, Fish Tank, stands as one of my favorite films of the past few years. It was the sort of picture that delicately examined the woes of adolescence through a feminine, lower-class perspective. With Wuthering Heights, Arnold adapts Emily Brontë’s gothic novel while maintaining the same sort of lower-class rugged appearance that made Fish Tank a success. Arnold’s transition is less a matter of her accomplishing a period-piece film, and more an attempt at shifting her style of urban realism to a new temporal setting. Arnold’s adaptation bares some striking similarities to how Lynne Ramsay adapted We Need to Talk About Kevin. Rather than zeroing in on a typical narrative arc, Arnold approaches the material with a level of lucidity. Divided into two fairly distinct time periods, Arnold probes the relationship between Catherine and Heathcliff as children through their adult lives. But to believe that there is any sort of structure to her narrative beyond that schism is deceiving – Arnold relishes in acknowledging the prevalence of memory and nostalgia as Catherine and Heathcliff assume their adult identities. Arnold utilizes the geography to great effect, uniting children and adults to the land as they reminisce. Arnold’s boldest move comes from her rejection Brontë’s central narrative focus on social class structure. Instead, she adds a racial component to Brontë’s work, which complicates the central relationship between Catherine and Heathcliff. Another particularly interesting aspect to the picture is how Arnold seems to purposely remove any typically romantic elements. Heathcliff’s stoic demeanor rejects many of Catherine’s advances as a child. And Catherine’s eventual rejection of Heathcliff when she agrees to marry Mr. Linton is given sparse narrative time to become a true moral dilemma. Unlike Cary Fukunaga’s Jane Eyre or Jane Campion’s Bright Star, Wuthering Heights rejects romanticism for harsh reality. Love can certainly blossom under such conditions, but Arnold seems to question its survival. 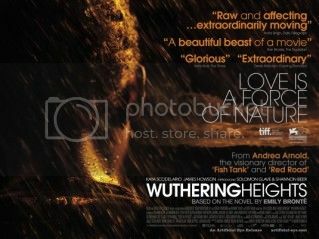 With excellent cinematography by Robbie Ryan and delicate touches in the editing department by Nicolas Chaudeurge, Wuthering Heights is largely a success based on its technical touches. The picture lacks a sense of emotional complexity that makes it difficult to embrace wholly. It’s particularly jarring given that there are moments in the film that seem to be tailored toward moving along a narrative that never fully develops. Perhaps most unfortunate is that Arnold’s rejection of a traditional narrative hindered the performances of her actors, which was a highlight of Fish Tank with Katie Jarvis and Michael Fassbender’s exceptional performances. Arnold remains a talent to watch, as the picture is less a misstep and more a noble attempt.